Definetly do not add anything other than coolant, I would say because you plugged the holes with the bolts you are not getting complete circulation, I would be curious to know what exactly are they? And if you only changed the driver side head gasket why not the passenger side? My head gasket blew out on that side and was pushing exhaust gasses into the cooling system. Just cruising across town will allow exhaust gasses into the system with out showing much of a temperature change because it can purge off into resivor. Get on the highway with sustained 3,000 rpm if ya got a 5spd and you will see the temperature begin to rise. That would definetly indicate a blown head gasket. Never ending stream of bubbles is coming from headgasket, or cracked head. Headgasket leaks can start very very slow. Will eventually get worse. There is no other source of "air" that can pump it's way into the cooling system. I have had small amounts of air sucked back into the cooling system during cool down when there was a slightly loos hose clamp, or seeping radiator leak. But these will not cause a never ending bubble supply. you could try a chemical 'block test' or send a coolant sample to a lab for analysis. sure seems like a HG internal leak though. Why didn't you change both head gaskets at the same time if you suspected one already? This stuff works best if coolant system is filled with water only for first few miles. Then drain system and add coolant mix. The additive pellets are generally believed to be ground ginger. You’ve learnt a golden rule of the flat four. If replacing one head gasket, you always replace both. If there are issues on one side you can expect issues on the other side too. 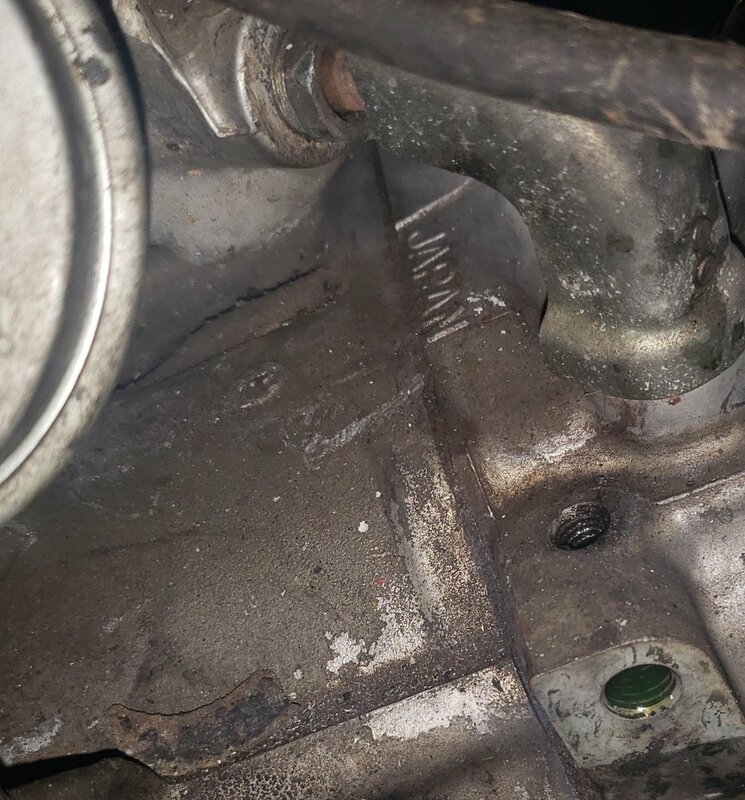 That bolt you’ve put in to stop the coolant coming out is a head bolt hole that has other smaller bolts drilled in the side of it. You’ve effectively plugged the head gasket leak with that little bolt. Rather than using a stop leak, try using pepper, as in salt and pepper pepper. If its only a small leak, pepper can seal it up enough to at least help diagnose the problem but apart from being either a head gasket problem or a cracked head/block, no other way air can be pumped into the system as previously stated. You can buy a test kit from some parts store that from memory wasn't all that expensive and it will tell you if exhaust gasses are getting in to your cooling system. I have found that getting the entire engine up to 150 to 190 degrees F makes a huge difference in successfully removing stuck bolts. Either by running it, or by using a space heater and a heat gun, to get enough power. Then carefully working the stuck ones loose / tight. Gradually, the sticking point moves further unscrewed. It helps to learn the feel of the bolt turning vs twisting. When they start to twist, that's when they snap. The radiator stop leak stuff can temporarily fix a 13psi leak from the radiator to the air. It won't survive the temperature and pressure involved with the combustion chamber. Agreed. Stopping combustion gasses is the job of the fire ring on the head gasket. Once that is compromised its all downhill. When I was taking the head bolts off they all looked fine. It was the one on the top front of the engine. When I went to put the head back on, one of the bolts started to tighten and need more force to move it. It all of the sudden got super easy. I pulled it off and the bolt now had the threads from the head on it. I used a helicoil to fix it. I have re sealed a handful of these engines. Had 1 head bolt strip during reassembly that was overheated badly. I follow the directions in the fsm - oil the threads, 3 tourque steps, order. No coolant shouldbe leaking out of any of the tapped extra holes in the heads. Many of those holes do intersect head bolt holes. Head gasket probably leaking into one of those. Yeah if anything nothing should be coming out those holes now we know which ones they are... I was thinking it was the elbow... I'd would suspect if it's coming out there the head is cracked/warped I spotted a light up the hole on the backside and seen that only it goes in and would bottom out. Could be deteriorated. If you can getaway with patching the leak then put those bolts back in you very well could get away with it until you find another head or another decent motor..And that man if it works you got into the Top10 at 3 for the best Subaru MacGyver of all time!! Ok, I’ll be that guy. Time to EJ it. You wont be disappointed! (Unless the new engine has a head gasket issue).